The annual BIS science, engineering and technology statistics make some interesting reading for a rainy Sunday. One of the more telling bits is the comparison of what the G7 countries spend on research and development (R&D). Spoiler alert: the UK doesn’t come out well in the rankings, but the various breakdowns help to discern where, in particular, it’s falling behind. 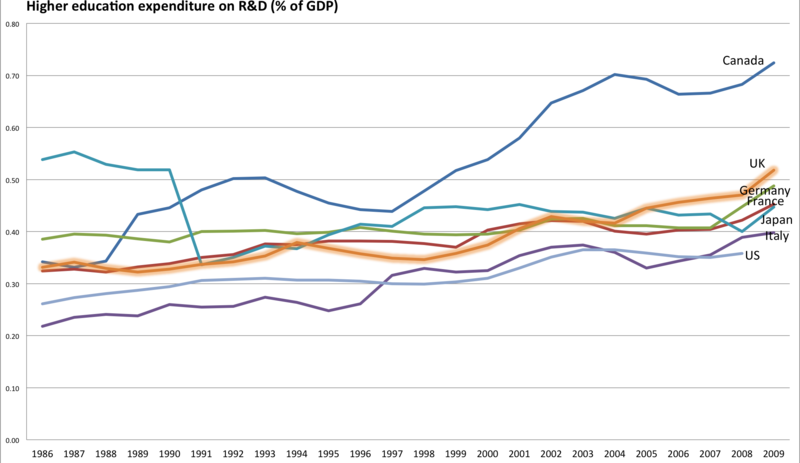 The overall measure is gross domestic expenditure on R&D (GERD). It’s the sum of R&D spent in business, university, government and not-for-profit sectors. According to a recent survey of OECD members (pdf), GERD is the most important indicator to member nations. 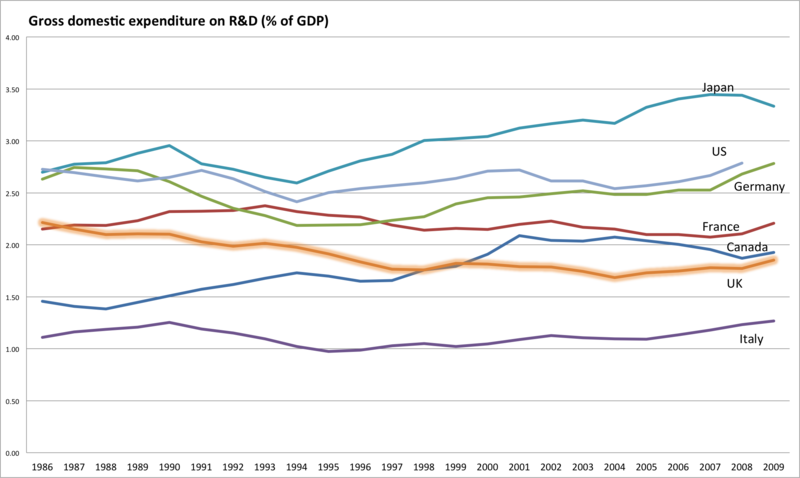 When graphed, what’s interesting is that though science’s frozen budget in the UK garnered lots of attention in the last couple years, R&D in the UK has actually been declining for decades. In fact the UK is the only one of the G7 countries to be spending less of its GDP on research and development now than in 1986. 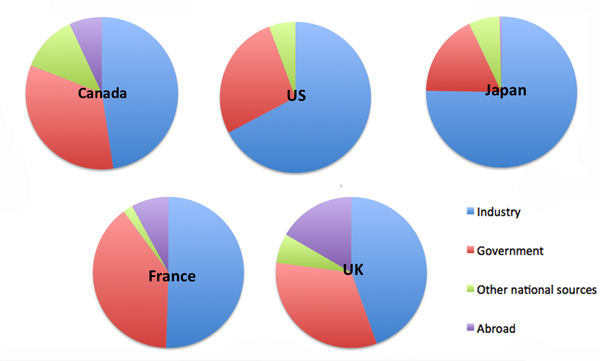 By that measure, then, the UK has been steadily increasing, keeping pace with most of the other G7 countries. Which perhaps isn’t surprising since elsewhere in the BIS data we learn that almost 28 per cent of the UK’s R&D (by expenditure) is performed by universities. That indicator has interesting implications for the Government’s current push to bring more industry funding to university research, most recently in the Catalyst Fund as part of the Life Sciences Strategy. If business spending on R&D is declining relative to GDP, will there be the appetite among industry to step up and fill the hole left by government? Others have fallen far – notably France and the US. Germany and Japan have actually managed to increase governmental spending on R&D, even post-recession. 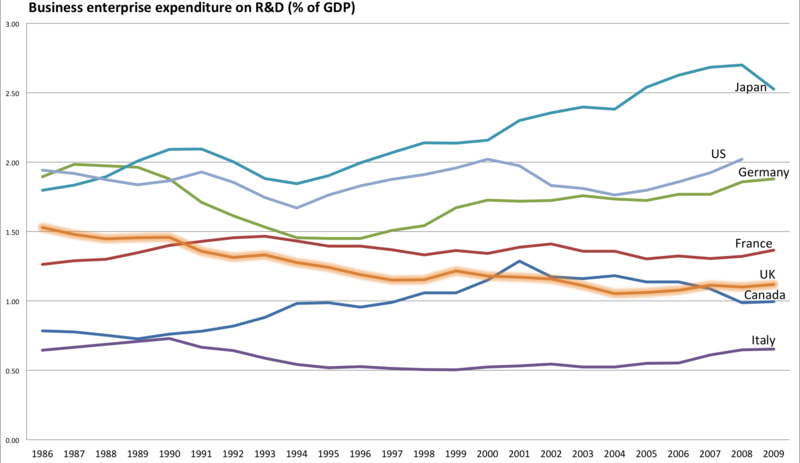 The UK’s R&D spend here has dropped by 0.16 percentage points since 1986, but has been holding steady in recent years. We can expect it to decline in the years ahead, though, since the frozen science budget will mean a cut in real terms to agencies such as the Department of Health and Defra, according to CaSE. All in all, then, it’s a complex picture of Britain’s research landscape. 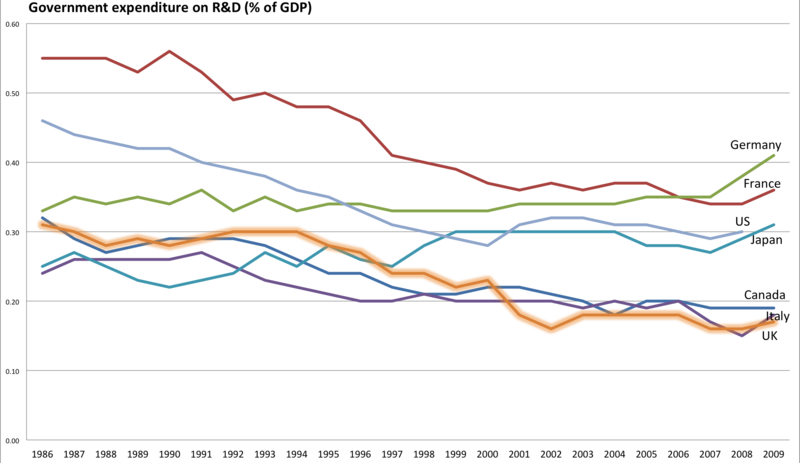 Government funding of R&D is declining, but government still makes up nearly as big a piece of the pie as industry in R&D (as compared to the US and Japan, the other two in the top five countries for research output, which have relatively more industry funding). Higher education remains a strength for UK R&D. But, with government funding of higher education also declining, more input from industry is expected to fill the gap, and doesn’t necessarily seem to be forthcoming from prior performance. Are initiatives like the Catalyst Fund the answer? Or perhaps more funding from abroad, which Britain already seems to excel at attracting? There’s a lot to analyse there, but a reassuring – and quite obvious – observation is the strength of our universities in attracting funding from abroad. It’s a shame our government doesn’t have the faith in our institutions that others abroad clearly do. It’s very true – and I didn’t address this very well in the post. What are these mechanisms/sources for funding from abroad? The biotechnology department I used to work in recieved a lot of funding from middle eastern states for research into ecology, biofuels and oil related microbiology (the very existance of such a subject might surprise many!). Universities are very aware of the money available from other countries that are still investing in science – malaysia being a favourite of my old uni – and have forged strong links. Those governments pay a lot to send PhD students over here so that they can return home and run their own research groups (and even whole departments), I suspect that makes a large contribution to Uni R&D. “UK universities have seen their income rise steadily from £21.3 billion to £27.6bn over the past five years but the proportion coming from industry accounts for just 1.1 per cent of the total, data from the Higher Education Statistics Agency shows.